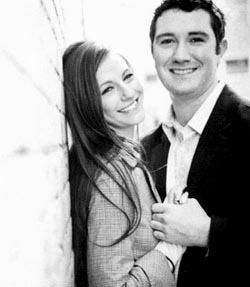 BERTHOUD, Colo. — Patrick and Tammy McClanahan, Berthoud, Colo., announce the engagement and upcoming marriage of their daughter, Candice McClanahan, to Richard Spicer, both are of Westminster, Colo.
Grandparents of the bride-elect are Robert and Melba McClanahan, Bailey, Colo., and Clara Flock, Winfield, and the late Ronald Flock. Parents of the prospective groom are Richard and Laura Spicer, Syracuse, N.Y. His grandparents are Elizabeth Spicer and George and Marian Tremblay, all of Syracuse. Candice graduated from Colorado State University with a degree in interior design. She is a sales representative for Dal Tile. Rick, a graduate of Daemen College in Buffalo, N.Y., earned a degree in health studies. He is a surgical support technician at Medtronic Navigation. The wedding is planned for Sept. 3 in Estes Park, Colo.